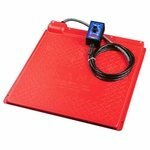 Kane Poly Pet Dog Heating Mats and Accessories. Provide optimal warmth for your dogs with Kane heated dog mats. Made of durable, easy to clean polyethylene, Kane mats provide a safe and consistent heating surface. Perfect for outdoor pens, kennels, garages, dog houses, and veterinary clinics. NRTL and CSA/US approved. The included Dial-A-Temp rheostat lets you quickly and easily lower the temperature to the level your dog needs -- just turn the dial clockwise to reduce the temperature. Poly Pet Mat Cover -- 18 in. x 18 in. Poly Pet Mat Cover -- 18 in. x 28 in.